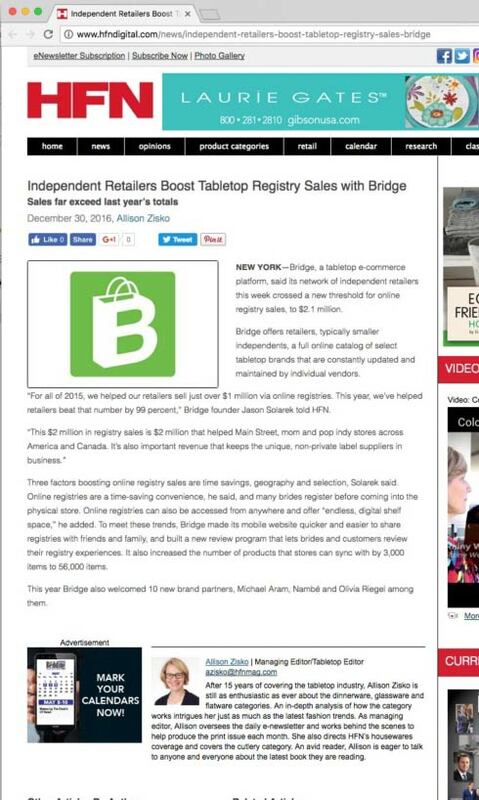 NEW YORK — Bridge, a tabletop e-commerce platform, said its network of independent retailers this week crossed a new threshold for online registry sales to $2.1 million. Bridge offers retailers, typically smaller independents, a full online catalog of select tabletop brands that are constantly updated and maintained by individual vendors. "For all of 2015, we helped our retailers sell just over $1 million via online registries. This year, we've helped retailers beat that number by 99 percent," Bridge founder Jason Solarek told HFN. "This $2 million in registry sales is $2 million that helped Main Street, mom and pop indy stores across America and Canada. It's also important revenue that keeps the unique, non-private label suppliers in business." Three factors boosting online registry sales are time savings, geography and selection, Solarek said. Online registries are a time-saving convenience, he said, and many brides register before coming into the physical store. Online registries can also be accessed from anywhere and offer "endless, digital shelf space," he added. To meet these trends, Bridge made its mobile website quicker, made it easier to share registries with friends and family, and built a new review program that lets brides and customers review their registry experiences. It also increased the number of products that stores can sync by adding 3,000 items from 10 new brand partners including Michael Aram, Nambé, and Olivia Riegel thereby bringing the total product sharing database to 56,000 items.